My Music Staff is all about saving you time. But did you know that it can also help you with your taxes? 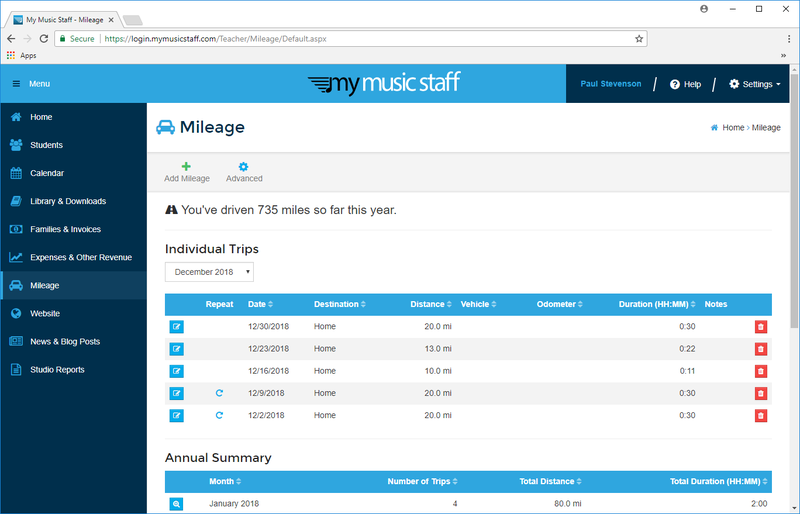 You probably already know that My Music Staff can help you track invoices and expenses, but did you know that it also can help you track the mileage that you drive as a music teacher? 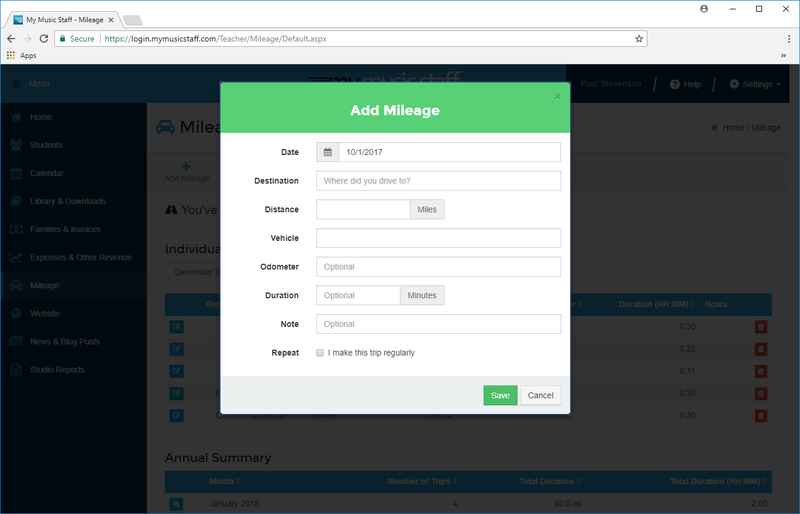 The easy to use interface lets you add mileage for single or recurring trips. If you travel to the same place each week you can enter a recurring trip once and My Music Staff will add the mileage for the entire date range you specify. It can optionally generate expense entries based on your areas mileage rate. When tax time comes around, you’ll be prepared. With My Music Staff you can also use your smart phone (or tablet) GPS to track your teaching mileage. 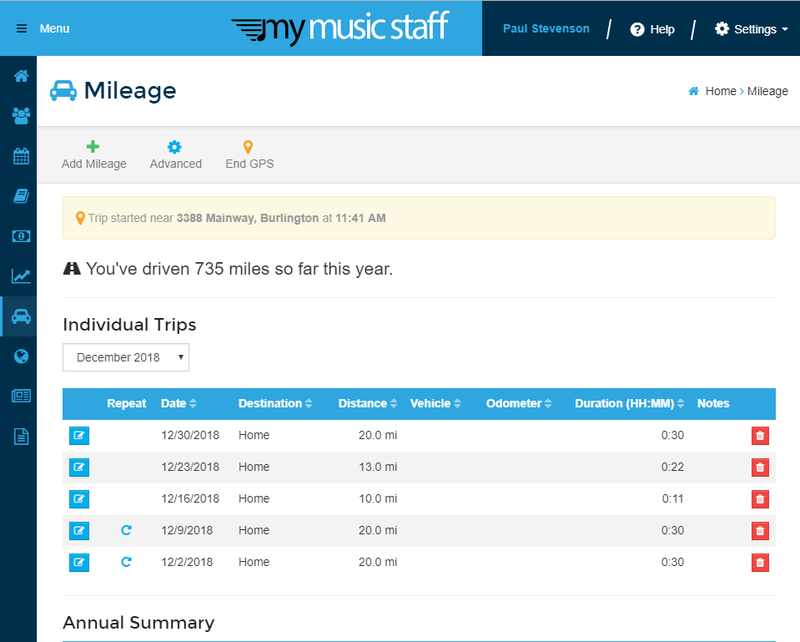 Simply log into your My Music Staff account from your mobile device, click on “Mileage” and you’ll see the “Start GPS Trip” button. To track your trip, click this button before you start driving and then click it again when you arrive at your destination. It’s that easy! My Music Staff will automatically determine the distance driven and add it to your mileage log. You don’t need to leave My Music Staff open to use this feature either, so you can use your phone for navigation or other things during your trip, and it doesn’t use any extra data on your device. In fact, you can even turn your phone off.